Found a really cool Hurricane Tracking KMZ file for Google Earth. Gives windspeed, projected course, and spectral satellite imagery for hurricanes found worldwide. 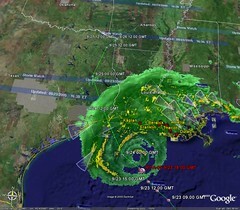 In conjucntion with the awesome real-time weather tools (scroll to the bottom to find the radar and satellite mosaics for the US) found over at googleearthhacks.com. I really feel like a weatherman with these amazing tools at my disposal. Google Earth BBS Post: "Hurricanes live positions (v 1.0) worldwide data"
gfeed - a blog neighborhood locator. Love the hurricane tracking tool!